While I had no luck getting in touch with Dwight Pickens via Facebook, I did Andre Alexander, and he offered as a bonus to help me get Dwight, an elusive member of the San Antonio Riders. A college teammate of Alexander, Pickens was a dangerous receiver, he finished his college career with 61 catches for 1169 yards and 8 TDs. He also carried the ball 16 times for 156 yards and 4 TDs. An equally shifty punt return man, Pick had 32 returns for 472 yards and a TD. Selected in the 8th round of the 1990 draft by the San Fransisco 49ers, Pickens did not make the roster of the team. 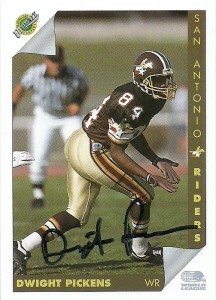 He’d be subsequently drafted by the San Antonio Riders of the WLAF in 1991 as a Supplemental Selection. The Riders had quarterback issues with Jason Garrett, Lee Saltz, and Mike Johnson all taking snaps. Pick posted modest numbers in the Riders offense, which was modeled after the ‘Skins offense of the late 80s. He had 20 receptions for 249 yards and 2 touchdowns, including a barn burner that was the team’s longest play from scrimmage at 82 yards. I am unsure as to why he didn’t return to the team in 1992, but the team had high turnover at the position anyway, with only Lee Morris returning from 1991. Still good friends with Alexander to this day, Pick and Andre frequently get together at alumni events. Dwight currently lives in SoCal.